It's hard to imagine a more stunning location for a meal. 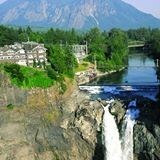 With outstanding views of the Falls and Snoqualmie River, The Dining Room at Salish Lodge & Spa provides a wonderful escape from the din of everyday life and a refreshing change from the typical Seattle restaurant experience. Our menu, features Northwest cuisine with flavors both simple and sublime, using seasonal ingredients and indigenous cooking techniques. Come in for our Salish Lodge Country Breakfast, a lodge tradition featuring a four-course breakfast, including our famous steel-cut oats and the iconic Honey from Heaven service where honey from our own hives is poured from high above your plate onto your buttery homemade biscuits. Or bring friends in for lunch and enjoy a relaxing meal by the fire. Of course, The Dining Room is most magical at dinnertime, and just what you would expect in the finest luxury resort in Washington.